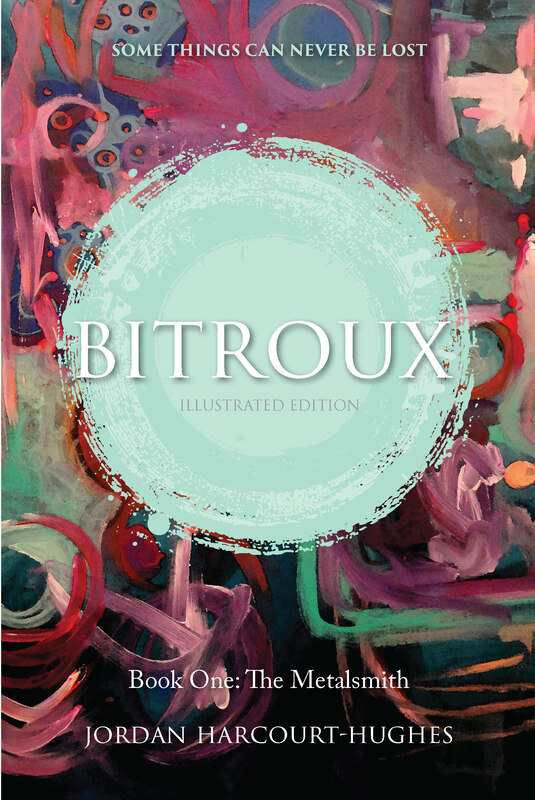 Bitroux is my first original work of fiction. Book 1: The Metalsmith is out now in print and e-book. A special illustrated edition of the book is also available. A media kit is available for media, bloggers and book reviewers: click here to request access. How much can the bonds between twins survive? Can they survive anger, distance, arguments left unsettled and a lifetime of experiences left unshared? Merouac is full of regret about the way he left things with his sister Malaena. Now she’s gone and he’s got his hands full taking care of her young daughter; a wilful and curious girl intent on giving him a crash-course in parenting. As Merouac juggles taking care of Evra with the pressures of his job as head metalsmith on the Transcontinental Railroad, a series of mysteries begin to emerge. A new star appears in the night sky; evidence that Ahm’s protective shield is down. Strange blue apparitions are making themselves known to Merouac, chanting the words ‘Down, Down.’ And then the mystery of Malaena’s death deepens, leaving Merouac with twice as many questions and no answers. As Merouac goes in search of his sister, he embarks on a journey across space and frequency and discovers that both memory and reason are fragile, and that the bonds of the heart may be more resilient than the planets themselves. Interested in hearing more about the world of Bitroux? Sign up for my monthly newsletter! You'll be the first to know about release dates for Book 2, competitions and dates for my writing workshops and courses. 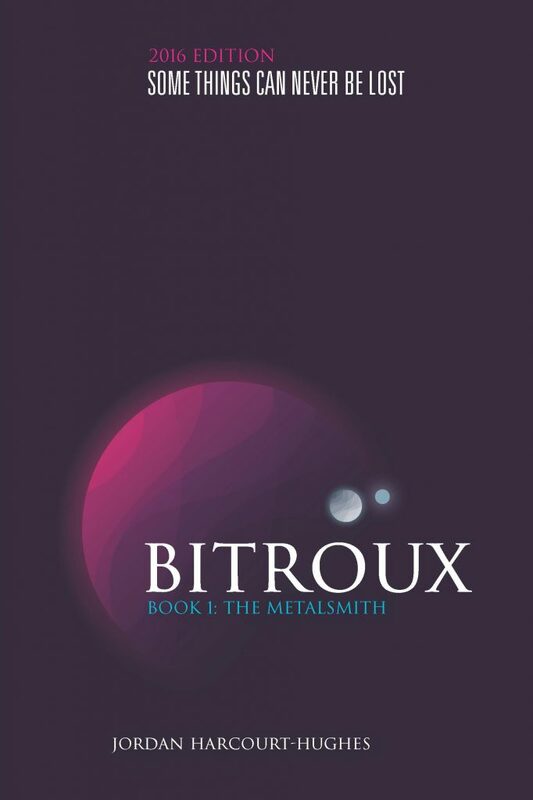 Bitroux is a sci-fi fantasy novel written by Jordan Harcourt-Hughes. It is set in a world rather like Earth around the time when the railway networks were being built. It explores quite a few themes such as family, extra-terrestrials and magic. It is the first book of the series ‘The Metalsmith’. The plot revolves around Merouac, a senior metalsmith working to build a huge railway line, and his niece, Evra. Merouac’s sister supposedly dies and leaves her daughter, Evra, in his care. However, soon we see that not all is as it seems. There are strange accidents that befall some trains on the line and the appearance of unearthly creatures with Top Hats that only Merouac and Evra can see. Things become even murkier when a strange Ayuherica woman named Heyla enters the story. She reveals that Merouac has the ability to ‘tune’ metal, which means that he can use metal as a conduit to communicate with other worlds. The characters come together to understand what is happening to the planet Ahm and the atmospheric shield that protects it. The shield seems to have disappeared, and this has opened the world up to contact from other planets. Along the way, there are several human moments where Merouac and Evra bond. We see them become a family. The loveliest thing about this story was the sheer surreality of it all. The planet that the story is set on is so similar to our own that we can so easily relate to it. Yet, there are so many alien elements to it that we never once lose interest. From the spectacular artwork to the style of narration, the author does all that he can to ensure that the reader is mesmerised and spellbound. The narration has a certain lilting feel to it. It causes the reader to feel as though the story just moves along, as if by its own accord. It is all extremely cohesive and comes together beautifully. The characters are also complex and nuanced. Merouac is the gruff bachelor who is saddled with a child. He must come to terms with guilt over his sister’s apparent death, his confusion at the bewildering events around him and the antics of his new niece. Evra is an innocent child who plays around a lot. Later, we see that she is not without her own secrets. The side characters also have hidden depths, and this makes the book all the more enjoyable. The only real problem that I had with the book came from its greatest strength. The narrative style works wonderfully when the author is setting up her world or describing mundane events. However, it does not change along with the pace of the story. As the action becomes intense, the lilting, steady flow of the narrative seems rather jarring and out of place. Apart from this minor fault, the book was excellent and complete. I look forward to reading the next book in this series. For the above reasons, I rate this book 4 out of 4 stars. I recommend this book to all fans of fantasy or science fiction, especially younger ones. This is a lovely story with hardly any adult content, making it ideal for younger fans of the genre. Merouac is overseeing the construction of one of the railway lines being built across the continent, and building metal trinkets in his time off. He has just started looking after his young niece, Evra, after her mother died. Merouac thinks he might be losing it when he begins to see a strange object in the sky, plus odd hazy blue apparitions around his workshop, but it seems his niece can also see them. Then Heyla, one of the Ayuherica gypsies, turns up, insisting that Merouac has the ability to tune metal – to allow it to pick up frequencies from other realms across the Broadsphere. I was delighted to win an illustrated digital edition of this book in the Australia Day giveaway back in January. The cover and several of the pages are covered in beautiful, colourful illustrations, along with sketches for each chapter heading. As part of the prize I also won a framed print of one of the coloured pieces! The story itself is one of the most unique and imaginative stories I’ve read in a while. The presence of railroads on an obviously alien planet with two moons is quite fascinating, as is the network of hahma power lines below the world’s surface. The idea of being able to tune metal and put together a portal to another realm or across the stars is a little bit Stargate and I loved it! This is a really very well written and presented book, especially since it’s self-published. 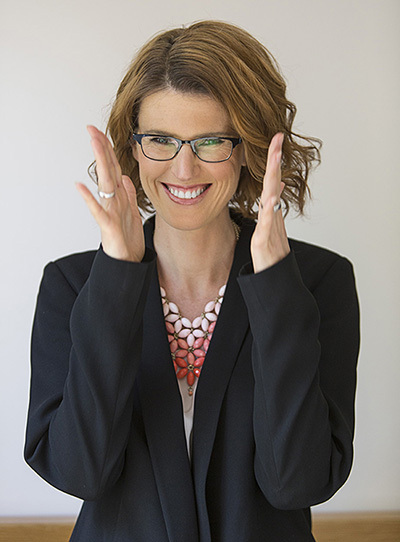 Jordan Harcourt-Hughes is actually a designer and content marketer herself and the polish really shows in Bitroux. I’m not sure whether she had someone to help with editing – the story is a little slow in places but it flows very well, the characters are personable and believable and over all, the book presentation is beautiful. The only downside of this story is that it’s so short. At only 232 pages, there’s barely time for any world-building, and I was left with plenty of questions. What was the planetary shield for? Where did Evra’s mum go? What does the railroad actually carry? Where does the electrical hahma power come from? I feel like I’ve barely dipped a toe in a much wider story, and I really hope that some of my questions can be answered in future books in this series. – A fantastic debut and a unique story, just a little too short to fully explore the ideas and flesh out the world building. I loved it though! More please! Helen Vincenti, author of The Othello Syndrome: ‘ Bitroux is now one of my favourite books’. Sydney Morning Herald critic Scott Murray, describing actor Ralph Fiennes’ performance in a film about Charles Dickens praised the “gravitas and internal creative fire to make us believe.” It is a perfect description of the author of Bitroux. The book’s title refers to the two moons of the planet Ahm where the action takes place and in the opening chapter we learn that the story involves the movement from one world to another. The author’s mastery of dialogue is also evident from the first page and like all the best science fiction thriller and fantasy writers she has created a complete world with its own language (instead of years they have “shades”) and when Barul, a construction worker, swears, it is “Hostane justen homan enoriana,” in the Tustennuit language. The food they eat, their towns, countryside, social structure and even the fish they catch in the rivers have been meticulously created. The hero of the story is Merouac, a metalsmith working on the construction of a railroad. He is on a quest. He is a man racked with guilt over the death of his sister, Malaena – until he realises she may not be dead. Then his quest is to find her. The author has a fine grasp of the human relationship dynamics that resonate with her readers and delivers the characters and plot with subtlety and precision. These are people we can engage with even though the world they inhabit is a product of the author’s imagination. A strange planet appears in the sky and is getting closer to Ahm. The people start to panic and descend underground to a system of caves and tunnels. The author builds a sense of fear and intrigue that propels the reader on, but this work is not a shock and awe horror-fest. There is no violence, rather the short, succinct chapters take the reader on an expertly timed mystery quest, each chapter drawing us further to an other-world discovery and finally a dramatic rescue. Without giving any more away the method used to communicate with the other world involves frequency bridges and if you enjoyed a film called “Frequency” a science-fiction thriller made in 2000 starring Jim Caviezel and Dennis Quaid, you will love Bitroux. It’s one of this reader’s favourite films and Bitroux is now one of my favourite books. Magical realism isn’t a genre that I’ve had a lot of exposure to and is a departure from my usual reading material but I liked the sound of this book so took the chance. I am so glad that I did as I loved this book. It had realistic characters that I cared about, a good plot and got me hooked within the first few pages. I bought the illustrated version which has beautiful images throughout. The central character Merouac is a metalsmith who cares for his niece Evra; both can see strange apparitions and the book explores the meaning behind their appearance and the connections people have to others. Despite the genre, the book isn’t too out there and I found I related to the themes, particularly the importance of the connections to those we care about. A great effort for a debut novel and I look forward to the next book in the series. Online Book Club ‘Snapshot’ reviews (reviewers who have read some or all of the book. When asked, all reviewers listed answered ‘yes’ when asked if they planned to read the whole book). gali: I love the concept of the book. The idea of using metal to communicate with aliens sure is original. I also liked the developing relationships between the metalsmith and his niece. va2016: I liked the book in every aspect – the narration, the writing style, the plot, and the character building. desantismt_17: The writing is beautiful. The world is my favorite part. Though familiar, it also feels foreign, and it makes me curious about what’s to come. look forward to seeing where this story goes. Yolimari: I liked that it is about a mentalsmith who discovers he has strange abilities and that there is a mystery about his sister, who used to say she would travel between worlds. I liked the dynamic between the mentalsmith and his niece Evra. He is trying to figure out how he will take care of her. I also enjoyed that he is working in the Transnational Railroad Project since 1910 in another planet. That reminded me of the history of the railroad in the United States. ritah: I liked that the narrative takes place on another planet with similarities as well as differences to our own. I also appreciated Merouac’s efforts in taking care of his niece that had just lost her mother. Libs_Books: The start of the book is very engaging. I love the developing relationship between Merouac and Evra; I love the tone and style of the writing; I love the way the writer uses strange language, “shades”, “hahamlight”, to indicate a strange world, and yet it’s so curiously like ours – suddenly we’re hearing about railway gauges in 1910.
micoleon13: I liked the mix of magic and reality, and that there were strong themes of family. I was immediately drawn into the story, especially Evra and how she was going to fit into her uncle’s life, and the mystery around her mother’s death. kfwilson6: The cover, genre, and reviews had me completely enamored with this book. Bluecobia: It’s science fiction but as a twist the setting is based on early 1900’s technology. A time when trains were growing as a major transportation source. I like this change of pace. lbhatters: I like the cover and the title. I don’t usually choose thus genre, but the writing is very good. I like the way the author writes and connects with the audience and seems to understand how people interact and think, which makes the characters and all that is happening in the story very real. cristinaro: Both the title and cover of this book have something alluring about them. They definitely stirred my imagination and made me think of all the mysteries of the universe. Besides, traveling beween worlds is a topic of high interest for me. The premise of the novel seems quite unusual, yet this is exactly the thing making it intriguing and appealing to readers. A metalsmith called Merouac has to take care of his 5-year-old niece Evra in an ill-suited environment. He does this with a devotion perhaps coming out of guilt for the death of his twin sister, Malaena. Strange things start happening. CrescentMoon: I like the unique premise and I’m a huge fan of science fiction. I think the concept of using metal to walk through worlds is really interesting and fun. I could feel Merouac’s predicament with losing his twin sister and faced with taking care of his niece. jwalker73: The colourful cover is eye-catching and I enjoyed the writing. These pages provided a very realistic portrayal of how you would feel if you were suddenly landed with a child, particularly if you had limited experience with children. KRay93: The cover has an intriguing style, which added to a seemingly vague premise, it gives a certain touch of mystery to this novel. The review confirms this additional touch to the sci-fi setting, even giving it a surreal nuance. Additionally, the author’s writing style does a good job of immersing the reader in the context of the story, which is very effective when facing stories that take place in different worlds. There is also some exposure to some of the particular characteristics of the society in this world. Scerakor: An epic fantasy with a steampunk/sci-fi twist to it. The writing style was excellent, the intrigue was built, and the characters engaging. I will definitely aim to read this book in the future. MsTri: I liked the general tone and smiled every time Evra was on the page; she reminded me of my youngest daughter when she was young. If I had to pick a favorite part, I’d select the scene where Evra met Berne and Sham Leoch, among others, because it was adorable. Kathryn Price: The idea of an alien civilization similar to ours is a fun twist to the usual alien story. BookishCreature: The writing was very good… with a defined voice. The author built up a vivid picture of this fantasy world with striking parallels to the real world.